Does God Approve Instrumental Music in church? Pictured left are two Buddhist prayer wheels. You put prayers inside and spin them. 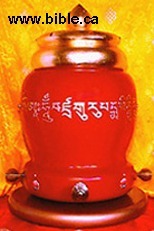 The prayer wheel is used by spinning the "wheel" around in a clockwise direction while saying your specific mantra or religious sayings. When the wheel is spun around in a clockwise direction, it is said that these prayers are sent out into the world. The large one is used in temples and can contain millions of prayers. The small one is for personal use. C.H. Spurgeon: "We might as well pray by machinery as praise by it." 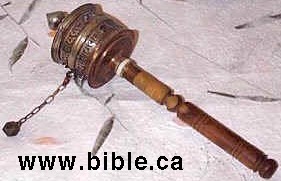 If you think using instrumental music in worship is OK, you might was well also use a "prayer wheel" too! The Bible, indeed, never condemns the use of instruments of music in worship, but neither does it command their use. Many things we know to be wrong are not condemned by name in the Bible. Thus, we can never assume that we have God's approval to do an act when no scripture teaches against that act. God has always required that man obey His directions; faith is defined as man's obedience to God's will, and man's actions contrary to God's will are called sin. Although the way in which God deals with man changed at the time of Christ's death, God never changes. Thus, God (who expected obedience in Old Testament times) expects obedience in New Testament times. This includes our era, today. In speaking of historical occasions in the Old Testament, Paul, in Romans 15:4 said, "For whatsoever things were written before were written for our learning, that we through patience and comfort of the scriptures might have hope." One of these historical occasions is when God dealt with the first of mankind, Cain and Abel, the children of Adam and Eve. The jealousy which ended in Abel's murder began when Cain made sacrifices to God that was not of faith. Abel, however, in following the directions of God, acted with obedient faith, thereby pleasing God. Hebrews 11:4 says of this, "By faith Abel offered unto God a more excellent sacrifice than Cain, by which he obtained witness that he was righteous, God testifying of his gifts; and by it he being dead yet speaketh." Telling of Cain's and Abel's sacrifices, I John 3:12 relates, "Not as Cain, who was of that wicked one, and slew his brother. And wherefore slew he him? Because his own works were evil, and his brother's righteous." Man's wisdom would say that there was little difference between the sacrifice of Cain and that of Abel. Cain, a farmer, gave from his fruits and grains, things he had raised. Abel, a herdsman, gave of his flock. Both made sacrifice; however, only Abel obeyed the word of God while Cain pleased himself. This is no, small, trifling matter as these scriptures have shown. The lesson is clear; like Abel, we must act from faith, and acting from faith means acting from the directions of God, not from directions of man's invention. 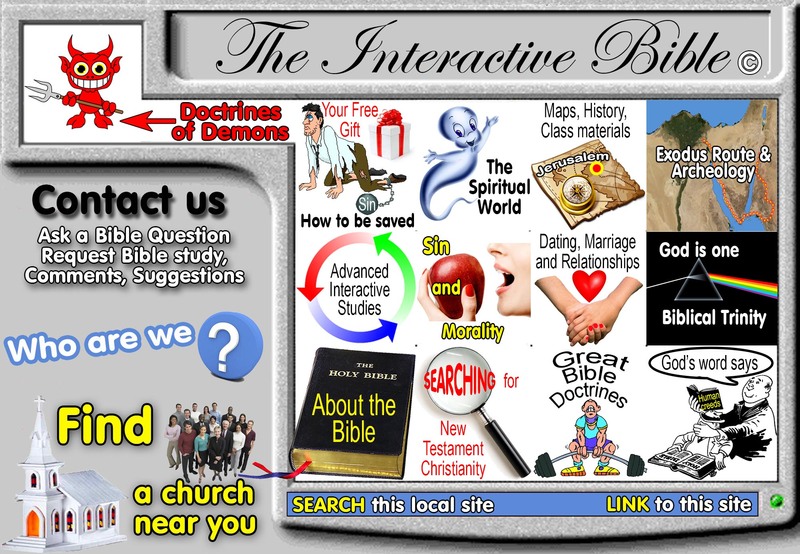 Revelations 22:18 tells us that we must not go beyond that which is written. In the Old Testament, God commanded Jewish worshippers that musical instruments were to be used, and when and where - God was specific (see II Chron. 29:25-28). Likewise, God has commanded, in the New Testament, the kind of music He wishes in modern Christian worship, and that is singing. Col. 3:16 reads, "Let the word of Christ dwell in you richly in all wisdom; teaching and admonishing one another in psalms and hymns and spiritual songs, singing with gladness in your hearts to the Lord." Similarly, Ephesians 5:19 instructs, "speaking to yourselves -in psalms and hymns and spiritual songs, singing and making melody in your heart to the Lord . . ." Other specific instruction, or examples, are recorded in Acts 16:25, Romans 15:9, Heb. 2:12, I Cor. 14:15, and James 5:13. Nowhere has God condemned the use of mechanical instruments of music in Christian worship, but nowhere has He commanded their use. When God specifies His wishes, things not commanded are automatically excluded. Because of the examples of Cain and Abel, and of others, and because God has made specific request for singing, God's people dare not act beyond faith by adding mechanical instruments of music to the worship services. This is why singing, accompanied only by the melody of the heart, is used in the worship services of the Lord's church today. God has always expected men to obey His revealed will. Punishment has often been the lot of men, who in seeking to worship God, do so in ways pleasing only to themselves. We, as Christians, must seek, therefore, to please God even in things, such as the use of instruments in worship, which the traditions of our society name as being unimportant. This is part 2 of a series of four studies which examine arguments, or reasonings, for the use of instruments of music in worship. We seek to find scriptural reason for accepting or rejecting each argument. This 'lesson examines the argument which claims that there can be no objection to the use of instruments of music in worship because they were used to summons worshippers to the Jewish services and the apostles went there to worship. Acts 2:46-47 shows that the apostles and their converts met daily in the temple. The times spoken of in this scripture were good times for the early church. The converts had the good will of all the people and the animosity of the Jewish Sanhedrin, which had engineered Jesus' death only a few weeks before, had been temporarily forgotten. At this time, however, the precepts of the early church were neither well formed nor, yet, committed to writing. With the exception of the basic doctrines of Jesus' sacrifice, repentance and baptism for the remission of sins (Acts 2:38), ,little had been presented by the apostles as doctrine for the early converts. All efforts were, at this time, directed toward the delivery to the Jewish nation of the news that the Messiah had come, had died, and had been resurrected according to the ancient prophecy. It was, at this time, probable that the worship of the early Christians was little different than before their conversions; most of the converts had been Jews by birth, Jews by extensive education, and Jews by devout lifelong practice. The passage of time and the continued teaching by the apostles would, yet, be needed to change these habits. Thus, it seems reasonable to assume that the worship of the individual early convert might have included the Sabbath (or Saturday) Jewish worship as well as the first day of the week (Sunday) observance of Jesus' life and sacrifice - the Lord's supper. Probably, however, these converts refrained from the Jewish blood sacrifices since even the earliest converts were quite aware that Jesus' sacrifice was all that was required. The apostle Paul, after having visited Greece, participated in Jewish worship after his return to Jerusalem (read Acts 1:26; I Cor. 9:20). Paul, for one was willing to conduct himself in a manner which would not offend his lifelong friends, kinsmen, and fellow Jews so that they would be open to response to the Gospel of Christ. This same Paul, however, wrote (in Gal. 3:11) speaking of the Jewish Law of Moses, "But that no man is justified by the law in the sight of God, it is evident: for, The just shall live by faith." Thus, Paul knew that his participation in Jewish ritual would not justify him before God. If, indeed, instruments of music were used to summons worshippers or were used within the Jewish ritual, and if, indeed, the apostles and their converts went there to worship, this failed entirely to influence the music of the New Testament church. The scriptures command singing and cannot be interpreted as including the use of instruments of music. Also, clear, well-documented historical evidence shows that the Christians of the first, second, third, fourth, and fifth centuries worshipped without using instruments of music. As shown in Part I of this series, the Bible commands singing; therefore, if we are not to act beyond (or without) faith, we must confine the music within Christian worship to singing. Thus, the argument is false that states that we may use instruments of music in Christian worship, today, because the apostles were once called to the temple for worship by instruments of music. There is no instruction in the New Testament, whereby the use of instruments is scriptural and history shows that the early Christians interpreted the apostles' instructions to mean that instruments should not be used. Where believers wish to please God, the question of whether to use instruments of music in Christian worship receives serious consideration. Although mechanical instruments of music, organs, pianos, and the like, have long been a part of traditional religious worship, Christians wish to know if their use is pleasing to God, or if their use is pleasing only to men. This is part 3 of a series of 4 related studies. Each study examines a separate reasoning, or argument, why instruments of music might be permissible in Christian worship. We wish to find scriptural grounds for accepting, or rejecting each reason. This lesson examines the argument which claims instruments of music are required in Christian worship because the Greek verb "psallo", translated in the New Testament as "sing", really means to "sing with accompaniment of mechanical instruments of music." Most Greek language lexicons, do indeed, show that the Greek verb "psallo" means to sing with accompaniment. These same lexicons also show this same verb to mean, "to twang a bow string" or "to snap a carpenter's line" and "to pluck a hair". The bulk of Greek lexicons in use today, however, show "psallo", when used in the New Testament, means "to sing". Thus, our translations of the New Testament use "sing", never "sing and play". Now let us examine several reasons why this is true. Active languages change with time; words change their meaning and the way words are used change. Words often have several different meanings and we can tell which meaning is intended only by seeing how the word is used. This is true of modern English as surely as it was true of ancient languages, including the Greek in which the New Testament was written. Consider, for example, the English word "gay". Until only a few years ago the meaning of the sentence, "It was a happy, gay party" was clearly evident; it referred to a happy, light-hearted party. Now, we can not interpret this sentence without further assistance from the context. Today, we must ask if referral is to a happy, light-hearted party, or to a gathering of homosexuals. This new meaning, which obscures the older meaning, is in wide use and dictionaries now list it along with the older meanings. Thus, the worth of the word is diminished and clarity cannot be obtained without further explanation. The meanings of words vary both with application and with geography. Consider how "sack" may mean "bag" or "dismissal" depending upon use. But, one meaning of "sack" is obscure in the South where "poke" is preferred. It is because words change with time, locality and application that the Greek lexicons show multiple meanings for "psallo". The Greek lexicons which are considered as reputable by modern Bible scholars, generally distinguish between developmental stages of a language and show the meanings of the word in question when used in a certain way during a particular period of history. Most of these lexicons show "psallo" to mean, "to sing a hymn", "to celebrate the praises of God in song", or "to chant". In none of these is the use of an instrument of music inferred except as indicated by the translation of Eph. 5:19, that of singing with the accompaniment of the human heart (or spirit). In this case, the heart is the instrument. Although a few of the better lexicons fail to show a particular New Testament meaning, or a very few of them may indicate that "psallo" means to "sing and play a mechanical instrument", history shows that the practice of the New Testament church excluded mechanical instruments of music. This historical fact cannot be denied and it supports the conclusions of the many lexicons that "psallo" means "to sing" or "to chant". These are the reasons why our New Testament translations command singing, and these are the reasons why the Lord's people (today) sing, accompanied only by the melody of their hearts. This is the last of a series of 4 studies which examine arguments, or reasonings, for the use of instruments of music in worship. We, as Christians, must wish to please God even in those things which our society names as being unimportant, such as the use of mechanical instruments of music in Christian worship of God. We wish, now, to find scriptural reason for accepting, or rejecting each argument. This lesson examines the argument that instruments of music may be used in worship because a Psalm, by definition, is always sung with instrumental accompaniment, and Eph. 5:19 commands Christians to sing psalms. Thus, say the proponents of this argument, to obey this divine command, instruments must be used. 1. Eph. 5:19 defines the instrument to be used; the human heart (or spirit) is to accompany the voice with melody. Thus, other instrumentation is excluded. 2. The Greek word for psalm, "psalmos", when used in the New Testament does not imply accompaniment by instruments of music. Thus, the Word of God which directs us today, the New Testament, does not command that instruments of music be used. Part I of this series (Tape # 310) shows that faith comes by hearing the Word of God (Romans 10:17) and that what is not of faith is sin (Romans 14:23). Thus, acting by faith is acting in obedience to God's word and acts done without divine authority are sin. Because there is no command to use instruments of music in the worship services, we cannot, in faith, use them. Therefore, we must not use mechanical instruments of music in worship of God today. Part III of this series (Tape # 312) discussed the translation of the Greek verb "psallo", which (after many earlier changes in meaning) is translated in the New Testament as "to sing"; the use of instruments of music not being inferred in this meaning. The Greek noun "psalmos" is the word translated as "psalm". A somewhat parallel evolution of meaning for "psallo" and "psalmos" occurred in ancient times so that both words once imp3ied the use of instruments; but, this was many years prior to the writing of the New Testament. In the New Testament, neither of these words imply the use of instruments according to the bulk of Greek language lexicographic authorities. Listen to Tape # 312, Part III of this series to learn how languages evolve and how the meanings of words change with time, locality, and application. Tape # 312, studies the Greek word "psallo", in detail. Acceptable modern New Testament translations are done by assembling of many scholars who represent the various schools of thought and the various religious denominations. These scholars apply vast stores of learning to produce accurate translations. Each scholar has, or course, personal prejudices, but these are nearly always balanced by the opposite prejudices of others in the assembly. Thus, the completed translation is quite free of personal prejudice and of denominational bias. God surely watches over these assemblies to insure that His word will not be corrupted, for I Peter 1:23 promises that the word of God will live and abide forever. Translations produced in this way are the word of God. They are accurate. It is these words that will be used to measure our lives on the judgment day. In all acceptable modern New Testament translations, the word "psalm" has today's meaning. Webster's NEW SCHOOL AND OFFICE DICTIONARY shows the word "psalm" to mean, "a sacred song". A song, of course, is a musical composition, a poem or ballad; a ballad is a short narrative poem adopted for reciting or for singing. Thus, there is no command or inference for the use of mechanical instruments of music in any of these modern translations. 1. The Greek language lexicons which show a particular New Testament use. 2. Assemblies of Bible translators who, collectively, translate "psalmos" as having no inference for the use of instruments. 3. The witness of history. History shows that the early Christians worshipped God in their assemblies without using mechanical instruments of music. They continued this way from the beginning of the Lord's church for more than 500 years until the traditions of men gradually introduced the use of instruments in the worship. How can some insist, contrary to this group of witnesses, that the use of mechanical musical instruments is implied in the word "psalm", as used in Eph. 5;19, and that we must use instruments if we are to obey God? There is no truth in the argument, instruments of music may not be used in modern Christian worship of God. To use them we must go beyond faith and act without scriptural authority, that is, we must act not of faith. Because, what is not of faith is sin, the Lord's people, today, sing praises to God accompanied only by the melody in their hearts.